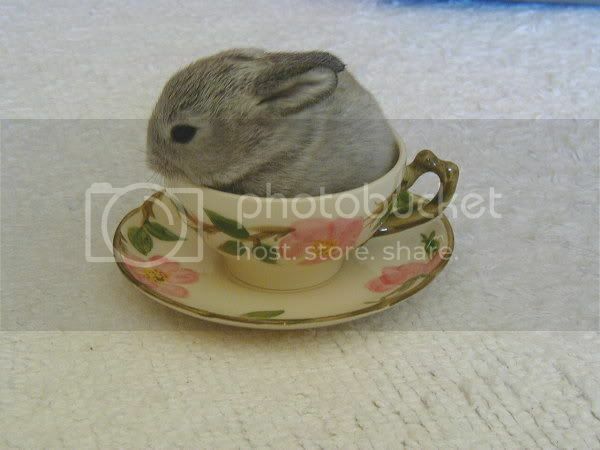 Gratuitous Tiny Bunny In A Teacup Tuesday. GAHHHHHHHHHHH!!! I just DIED. You killed me. Murderer! my apologies and condolences to the Misc family. Just so wrong! Nothing can be that adorable! Gratuitous bunnies are always a good thing. I think its a chinchilla. Um, this needs to happen every day, please! oh that is just the cutest thing. hey, someone on craigslist in allentown is selling that tea set. weird. Aww how cute, look at him the little nipper!